Annabelle Gawer, Imperial College London Business School. As markets expand and technology grows more sophisticated, it becomes crucial to understand the process and problems of designing complex systems. 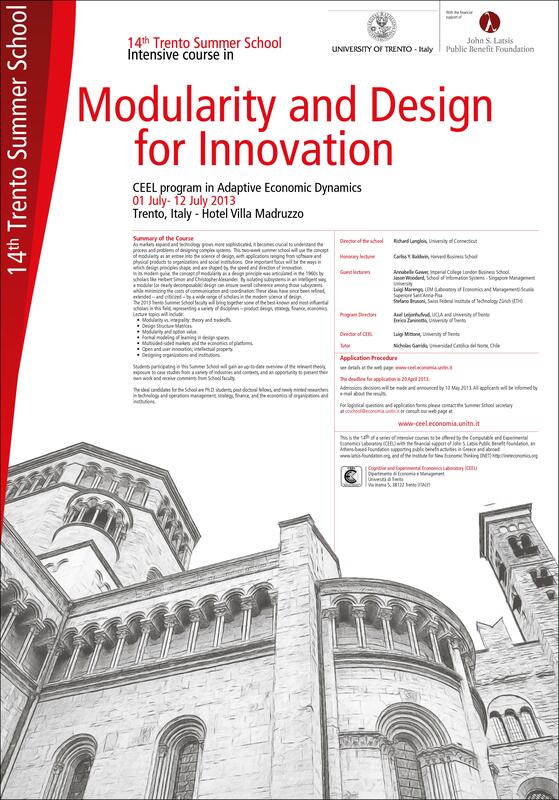 This two-week summer school will use the concept of modularity as an entree into the science of design, with applications ranging from software and physical products to organizations and social institutions. One important focus will be the ways in which design principles shape, and are shaped by, the speed and direction of innovation. In its modern guise, the concept of modularity as a design principle was articulated in the 1960s by scholars like Herbert Simon and Christopher Alexander. By isolating subsystems in an intelligent way, a modular (or nearly decomposable) design can ensure overall coherence among those subsystems while minimizing the costs of communication and coordination. These ideas have since been refined, extended  and criticized  by a wide range of scholars in the modern science of design. Modularity vs. integrality: theory and tradeoffs. Formal modeling of learning in design spaces. Multisided-sided markets and the economics of platforms. Open and user innovation; intellectual property. Students participating in this Summer School will gain an up-to-date overview of the relevant theory, exposure to case studies from a variety of industries and contexts, and an opportunity to present their own work and receive comments from School faculty. The ideal candidates for the School are Ph.D. students, post-doctoral fellows, and newly minted researchers in technology and operations management; strategy; finance; and the economics of organizations and institutions. People interested in participating in the Summer School are encouraged to fill in the application form on line and submitting a curriculum vitae, a two-pages essay describing their interest in Modularity and Design for Innovation, a course transcript from their PhD program, including advanced examinations passed, two letters of recommendation, and statements about their current or projected research, along with relevant research papers, if any. Applications are due by Saturday, 27 April 2013. Admissions decisions will be announced by 10 May 2013. All applicants will be informed by e-mail about the results. The sessions will be held at Hotel Villa Madruzzo, Trento, Italy. All participants are required to stay for the entire duration of the event. Food and accommodation will be covered by the School (except for meals during the weekend) and participants will have to cover travel expenses. Please direct logistical questions to the Summer School secretary (ccschool@economia.unitn.it). Institute for New Economic Thinking (INET) http://ineteconomics.org. Design by FCT. Photos by Fotogrph and CEEL.